Students develop relationships with classmates and enhance their skills by participating in our learning communities. 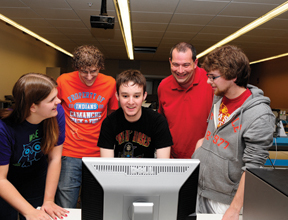 Iowa State’s learning community programs are ranked among the top 25 in the United States. Our learning communities help you start off college on the right foot—you get to take classes with students who share similar interests and meet faculty who can advise you on career options. At Iowa State, learning communities are small groups of students who generally take one, two, or three courses together. They also may live in the same residence hall. As a student in the Department of Electrical and Computer Engineering, you can participate in the Computer Engineering Learning Community, Electrical Engineering Learning Community, or the Women in Science and Engineering Learning Community. Students in the Computer Engineering Learning Community get to do a range of projects, including learn about the technology behind the Rock Band video game. Each year, the group hosts an American Idol-style content in the evening where students make presentations on what they’ve learned about Rock Band technology, plus get to compete in singing and other challenges. The Electrical Engineering Learning Community enhances the experience for first-year electrical engineering students. It involves lab sessions, academic help sessions, and community meetings that emphasize to students the value of understanding the learning process, questioning, being brave to learn new materials and ideas, and being passionate about the learning process. Students in this learning community get to develop their problem-solving skills through a variety of discussions, group work, hands-on projects, and classroom tools involving classic riddles, trigonometry, statistics, basic electrical engineering principles, MATLAB software. Learn more. This learning community is designed to help women in science and engineering fields be successful by providing social and academic support. Women in this learning community also participate in activities to improve leadership skills. The Women in Science and Engineering Learning Community offers learning communities for first-year, second-year, and transfer students. Learn more. In the Software Engineering Learning Community (SELC), students will take common courses together during their first year. Students will be put into a learning team with 20 students and will have a peer mentor to help them through their first year of college. Learn more.